Garcia Elementary’s faded colors are brightened up with fresh paint. 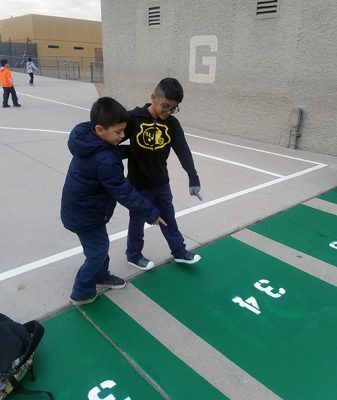 Jordan Barrow was marking and chalking paint lines at a worn-down outdoor basketball court at Alfred F. Garcia Elementary School when he looked up at a friend. 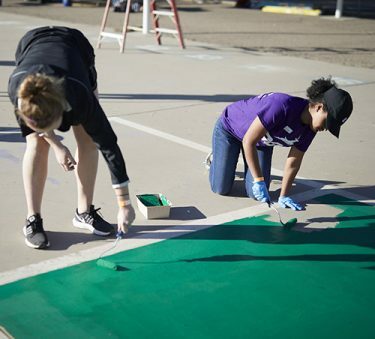 That Spirit pervaded the impoverished school Saturday morning as Barrow joined 300 of his fellow Grand Canyon University students and 50 more volunteers from Habitat for Humanity for the semiannual Serve the City outreach event. The volunteers woke up early on a Saturday to shovel mounds of sand into two playground areas, paint the exterior wall of the school, turn the outdoor basketball, four-square and hopscotch squares into splendors of color, and even refill by hand the faded school emblem at the school’s entrance with fresh color. 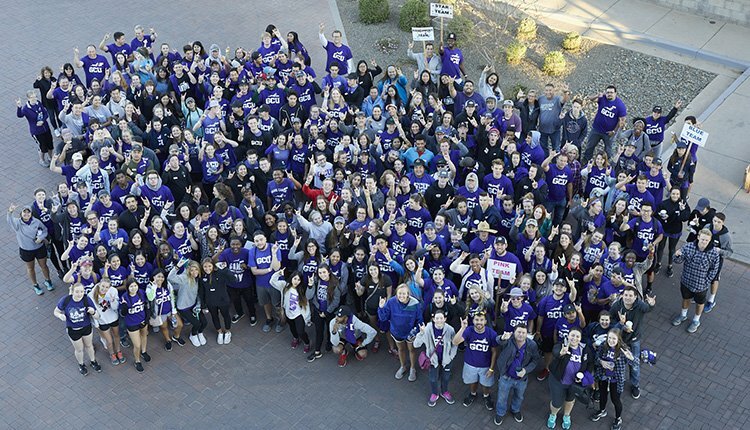 “As GCU students we are grateful for the opportunity to bless others and to be able to showcase their community in a better light,” Barrow said. GCU President Brian Mueller also jumped into action. Students at Garcia Elementary buzzed with excitement when they hopped off their buses Monday morning. Their mouths hung open in awe. “Look, it’s different! It’s different!” they shouted, tugging on each other’s shirts and pointing. They then ran to celebrate the new playground with a game of tag, four-square and basketball. “It’s not messed up anymore,” one student said before dropping down his backpack to play. Students paint the colors for a Foursquare. Nestled in an industrial area filled with junkyards, homeless encampments, jail houses and businesses enclosed by barbed-wire fencing, Garcia Elementary sits two miles southwest of the state Capitol in downtown Phoenix. It is one of four schools in the Murphy School District, which has seen declining enrollments and test scores amidst a shortage of full-time teachers and overall deteriorating conditions. Murphy Superintendent Jose Diaz said the partnership with Grand Canyon, which also includes GCU students helping as tutors both during and after school, is changing all that. Cassandra Jarles, director of sponsor relations at Habitat for Humanity Central Arizona, couldn’t help but smile Saturday as volunteers worked to transform the school’s exterior into a vibrant place for its students to learn, play and grow. Murphy School District Superintendent Jose Diaz shares a few words. 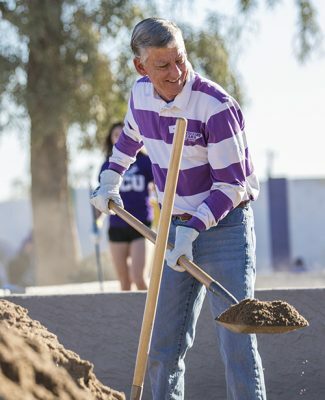 Even GCU President Brian Mueller dived in to help, moving dirt and shoveling sand. Mueller emphasized that this is not a short-term relationship. Fifty of GCU’s College of Education students spend three days a week at Garcia helping to teach kindergarten through third grade math, social studies, science and art. Another 21 GCU students provide academic assistance after school twice a week to 16 targeted students at each of the four schools in the district. And GCU provides leadership coaching for Diaz and all four principals. Students at Garcia Elementary were excited to see the transformation on Monday morning. The next phase of the GCU-Murphy partnership will feature 20 college students working with 10 children apiece after school at Hamilton Elementary in a setup similar to the University’s Learning Lounge. St. Mary’s Food Bank will provide a hot meal, just as it does when area students come to GCU’s campus for help in the Lounge. Through Habitat for Humanity, the Murphy School District will experience a revitalization of its schools as well as homes in the surrounding neighborhood, said Jarles. Thank you so much for all you have done to help our little school district. God bless all that got involved! Wanted to give a big thank you for all the support and caring you have given to our students and staff and community. In God We Trust!